Hawaiʻi ʻamakihi with avian pox. Symptoms of this virus, which can be spread by mosquitoes, include tumor-like lesions on unfeathered parts of a bird’s body, including feet and legs, around the eyes, and at the base of the bill. USGS photo. Today’s Volcano Watch is courtesy of our U.S. Geological Survey colleagues at the Pacific Island Ecosystems Research Center, which focuses on Hawaii’s biodiversity. Mosquitoes have been on the minds of Hawai‘i Island residents and visitors due to the recent outbreak of dengue fever. On February 12, 2016, Hawaii Governor David Ige declared a state of emergency for all mosquito-borne illnesses, including dengue fever and Zika virus. To help understand our collective risk, it’s useful to review the ecology and natural history of mosquitoes in Hawai‘i and their impacts on the health of humans and native wildlife. Although six species of biting mosquitoes have been introduced to the State of Hawaii, only three are likely to occur in natural areas like forests and parks—the Asian tiger mosquito (Aedes albopictus), Asian rock pool mosquito (Aedes japonicus japonicus) and southern house mosquito (Culex quinquefasciatus). All three use water-filled containers and pools in the forest and along the coast as larval habitat. Larvae of the yellow fever mosquito (Aedes aegypti) and bromeliad mosquito (Wyeomyia mitchellii) also use small containers, but are more closely associated with homes and gardens than forests. The sixth species, the inland floodwater mosquito (Aedes vexans nocturnus), can also be found in more developed areas where larvae are found in irrigation and roadside ditches. 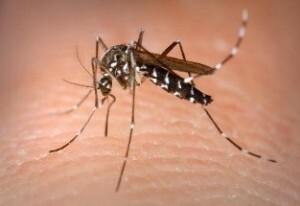 All of these mosquitoes can cause annoying bites and allergic reactions, but only two are currently recognized as vectors of human disease in the Hawaiian Islands—the yellow fever and Asian tiger mosquitoes. The yellow fever mosquito is recognized throughout the tropics as the primary vector of the yellow fever, dengue, chikungunya, and Zika viruses. Fortunately, these mosquitoes appear to be restricted to small coastal populations and have rarely been seen inland on Hawaiʻi Island. Unfortunately, Asian tiger mosquitoes are abundant, widespread, and capable vectors of dengue fever in Hawaii. They have also been implicated as vectors of the chikungunya and Zika viruses, but transmission of these diseases has not yet been reported from Hawaii. These two species share similar larval habitats, but Asian tiger mosquitoes have largely displaced yellow fever mosquitoes from much of their former geographical range. Yellow fever mosquito populations still occur in isolated and dry coastal communities of Hawai‘i Island, where this domestic (living almost entirely in and around homes) mosquito may have a competitive edge over the Asian tiger mosquito. As one might expect, Asian tiger mosquito populations increase after heavy rains that create more habitat for breeding. When rains coincide with warm summer temperatures, populations explode, providing ideal conditions for virus transmission. But even during drought, persistent populations of yellow fever mosquitoes could still drive local transmission. In Hawaii, mosquito-borne disease is not limited to people. Native Hawaiian forest birds have been losing a long battle with introduced bird malaria and pox virus since the arrival of the southern house mosquito in the early 1800’s. This mosquito can be found from the coast to high montane forests. Year-round transmission of bird malaria and avian pox in the lowlands has restricted most native forest birds to higher, cooler elevations, where mosquito numbers are limited. Southern house mosquito larvae are found in habitats similar to the Asian tiger mosquito—lowland forests and developed areas, as well as in feral pig-created tree fern cavities and wallows in remote montane forests. 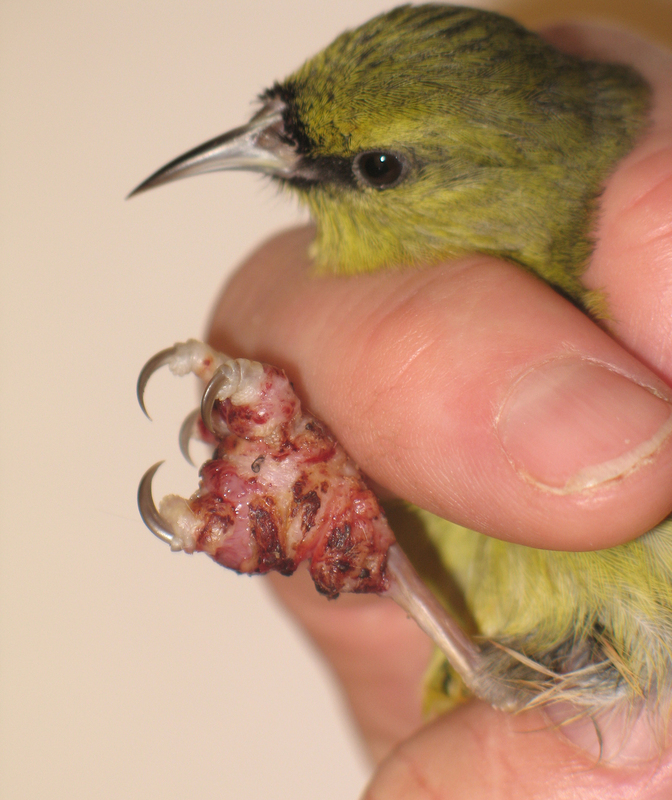 Like mosquito-borne human diseases, climate change is expected to increase the geographical range of bird malaria in the Hawaiian Islands, threatening the last populations of our native forest birds. Elsewhere in the world, the southern house mosquito is responsible for the transmission of parasites that cause viruses, such as the West Nile virus. U.S. Geological Survey ecologists in Hawaii are studying the ecology of mosquito-borne disease in native birds, trying to understand how climate change might alter that disease system, and how we can reduce disease transmission. They’re also assisting the National Park Service to monitor mosquito vectors in Hawaiʻi Island’s coastal parks with a goal of improved mosquito control to protect public health. While the development of vaccines and more efficient mosquito control continues, it’s likely that people and wildlife in Hawaii will be dealing with mosquitoes and the pathogens they transmit into the future. More information on mosquito-borne illness and how to protect yourself and your family is available online: USGS Pacific Island Ecosystems Research Center (www.usgs.gov/ecosystems/pierc/) and Hawaii State Department of Health (www.fightthebitehawaii.com/).